The DJIA hit 13,000 briefly today for the first time since May 2008. 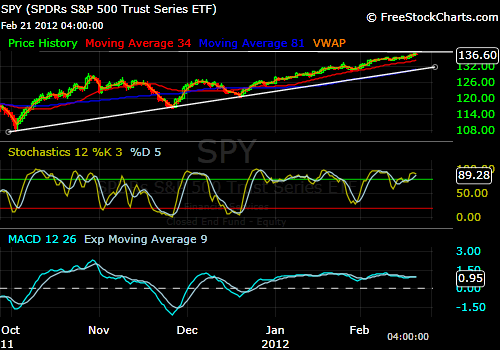 The SPY traded 137.05 and backed off as I had mentioned I thought it would in previous posts. I still expect the market to struggle a bit against this level so my bias of selling any rallies is the same. However, I like to see the longer term moving averages flatten before I see a larger reversal. Below are images of the 4hr and 2 hr charts. 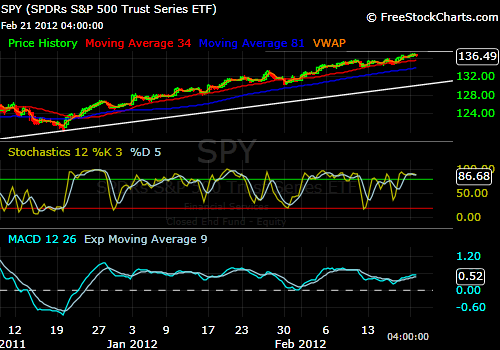 You can see that the 34 Moving Average(red line) has not rolled over or flattened. It is still trending up. This should make it easier to understand wht I mean by flattening moving averages.